Fellow Dodger fans, I know exactly how you feel! No matter what happens in the NLDS, I just don’t want to see this happen again. Since I started following baseball again…. 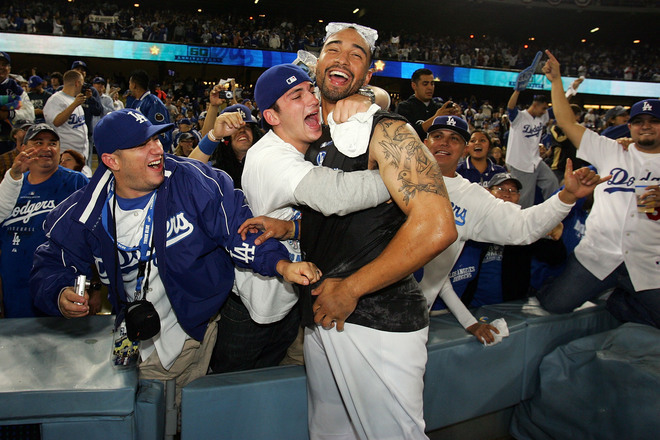 the Dodgers have made the playoffs three times, 2004, 2006, and now again in 2008. Not much to speak of in 2000, and although 2002 was a banner year for their pitchers, the same can’t be said of their hitters. In honor of the Dodgers/Cubs tilt tonight, these fine folks encourage you to partake in some birria today. Won’t find that up here, but it’s plentiful back in California. And I do admit I’m much more of a carne asada type. Not that I believe in those silly old baseball curses or anything! Though I should be reminded that the until recently long-cursed Red Sox and White Sox finally upended their harbingers of gloom.